I read the tweet from the back row of Davies Auditorium as I waited for Gay — one of today’s most relevant critics, novelists, editors, and essayists — to take the stage in SSS (or, rather, in my remote location, appear on projectors). On the Facebook event page for Gay’s reading and Q&A, over 300 people said they were “Going,” and almost 1,000 indicated they were “Interested.” The auditorium in SSS seats 414. Even those of us who arrived right on time for the event were too late to secure one of the coveted 414 seats. We were annexed to Davies Auditorium, where we endured an onslaught of technical difficulties that plagued our experience of the event. Well, most of us. 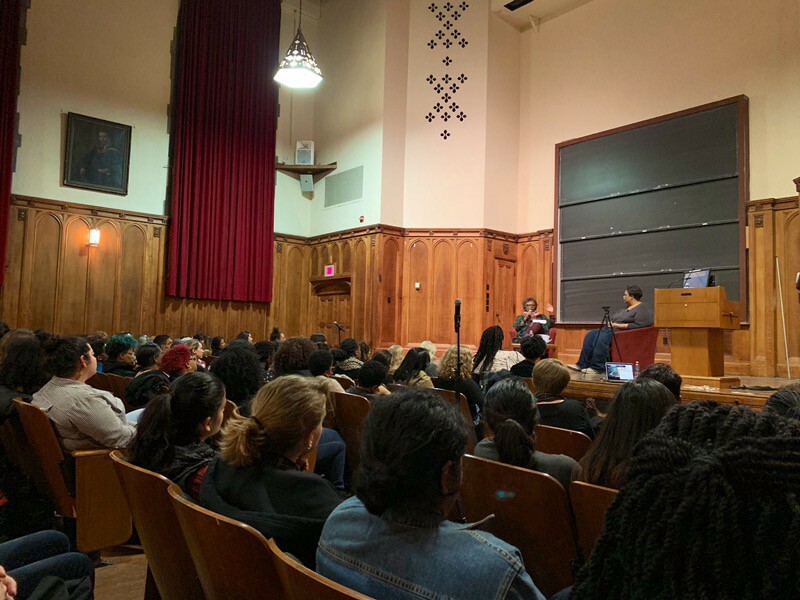 Small groups of audience members trickled out every once in a while, but the largest exodus occurred within the first few moments of Yale professor Claudia Rankine’s introduction. The ill-positioned camera and staticy audio elicited little faith from an audience hoping to give Gay its full attention. Those of us who remained — about two-thirds of the amount I’d counted while searching for a seat among the beanie-clad attendees in Davies — could hear bursts of laughter from the lucky live audience in SSS, but the audio was almost always too muffled for us to catch the joke itself. Out of fear of missing another, all errant stirs from the audience ceased during moments of (relative) audio clarity. One of these moments came after the reading, during the event’s conversation/Q&A segment led by Rankine. The audio cleared up just in time to hear Gay recount a memory from “Cross Campus Library” (now known as Bass Library/Purgatory): “I would go online and pretend I was anywhere but New Haven.” Her wit and transparency transcended the evening’s logistical complications, reminding me of just how stoked I’d been on the way to hear her speak. This wasn’t my first time at one of Gay’s public events. Much to my chagrin, I am not one of the blessed few in her class, Writing Trauma, this semester, but I did have the pleasure of meeting her a couple of years back at a talk led by Ann Patchett at Vanderbilt University. I wasn’t even admitted to Vandy. But at least I could find a seat there, in the same (substantially sized) auditorium as everyone else. Listening through Static was originally published in The Yale Herald on Medium, where people are continuing the conversation by highlighting and responding to this story.